Neil is a renowned writer, keynote speaker and the founder of Only Dead Fish, a digital consultancy that specialises in applying strategic understanding of digital and emerging technologies to help businesses and leaders optimise their effectiveness within the new, digital-empowered business environment. Neil is the author of ‘Building The Agile Business’ (Kogan Page, April 2017) which provides an essential guide for leaders on achieving greater organisational agility and effective digital transformation. 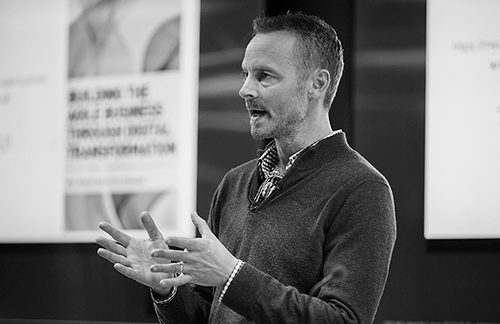 He has run global digital leadership programmes and consulted on transformation with a broad range of large, multi-national businesses and is a regular keynote speaker across the globe on digital transformation, agile strategy and leadership. He’s been named by BIMA (British Interactive Media Association) as one of the most influential people in the UK digital industry, and by SAGE as a TOP 100 Global business influencer. He curates the global quarterly series of Firestarters thought leadership events on behalf of Google, is a keynote speaker on the Google Squared programme and has worked with market-leading global businesses including The Financial Times, BBC, Warner Bros, Vodafone, GSK, the UK Government, Samsung and YouTube. He is an associate of The Futures Agency, a collaboration of some of the world’s leading forward thinkers and futurists, and is also the co-founder of the Fraggl Twitter curation app.